Radon is a radioactive element that is part of the radioactive decay chain of naturally occurring uranium in soil. You can’t see radon. 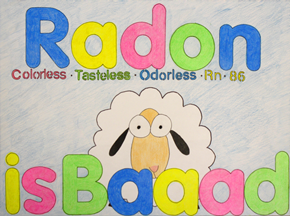 You can’t smell radon and you can’t taste radon. Unlike carbon monoxide and many other home pollutants, radon’s adverse health effect, lung cancer, is usually not produced immediately. Thus you may be exposed to radon for many years without ever suspecting its presence in your home. Since there is no known safe level of radon, there can always be some risk. But the risk can be reduced by lowering the radon level in your home. A simple radon mitigation system can be installed. Radon reduction systems work and they are not too costly. Some radon reduction systems can reduce radon levels in your home by up to 99%. Even very high levels can be reduced to acceptable levels. You CAN protect your family from the dangers of radon gas. I have a new home with no cracks or other openings, so why should I test for radon? As a gas, radon can seep through tiny cracks that you might not even see. It can get into finished or unfinished basements, and into new homes as well as old. You won’t know if it’s in your home unless you do a radon test. The builder says my new home is radon resistant, so I can’t have radon, right? Even if you have purchased a home with Radon Resistant New Construction (RRNC), unless you, the builder or a home inspector tested your new home for radon, that’s not necessarily so. Although the name Radon Resistant New Construction implies that the home resists radon, RRNC simply is the installation of radon system pipes without a radon mitigation fan. Without the fan, the home is “radon system ready,” but not resistant to radon entry. If radon is a health hazard, what are the symptoms? Radon is a sneaky gas. Just as you can’t see it, smell it or taste it, it also gives you no warning that it is harming your health. There’s no rash or headache or fever. Radon causes lung cancer, which often presents no symptoms until it is advanced. The only way to be safe from radon-related lung cancer is to test for radon and have the radon mitigated if the level is above 4.0 pCi/L. Is there really any proof that radon causes lung cancer? As with most illnesses, cause and effect can not be 100 percent proved. If you have high blood pressure and suffer a stroke, studies indicate that your high blood pressure is the most likely cause. Similarly, epidemiological studies have presented compelling evidence that radon is the number one cause of lung cancer in nonsmokers – and that smokers who are exposed to high radon levels are 10 times more likely to get lung cancer. The National Cancer Institute says that radon is associated with 15,000 to 22,000 lung cancer deaths each year. What do I do if my radon test result is high? Contact a certified professional radon contractor (mitigator). What is a High Radon Level? There really is no safe level of radon exposure. 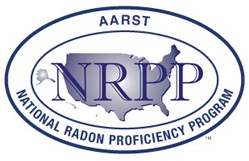 Radon gas is measured in picoCuries per liter (pCi/L). 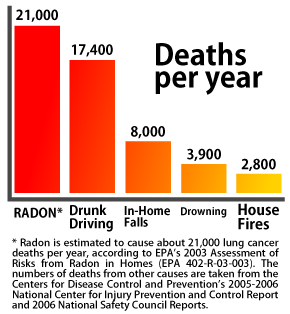 The current airborne radon level at which the EPA recommends action is 4.0 pCi/L. Further, the EPA says to consider action if the level is 2 to 4 pCi/L and suggests that every home and workplace be tested for radon gas in the air. What are Factors That Can Affect Radon Levels? Several factors can influence your radon test results. Keep in mind, however, that although radon gas levels might vary somewhat from one day-to-day, it is unusual for the difference to be significant. 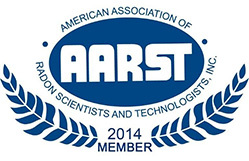 If you doubt your test results, you might choose to retest yourself or hire a certified professional. © 2019 Stu's Absolute Inspections. All Rights Reserved.